As a member of Shespeaks.com, I was recently asked to have my little guy try the new Hormel® Compleats® Kids Microwave Meals. I was hesitant, because I know how picky this kid can be! He will reluctantly eat chicken in nugget form, but not other meats, or any other form of chicken. He isPiCkY! We received several meals to try, plus two coupons for Hormel® Compleats® Kids Microwave Meals Well, David chose the ravioli for lunch the next day, but after discovering that it contained beef, he clamped those lips shut and wouldn't try another bite. I tried them and they were delicious - rich sauce, tender ravioli - yum!!! So it's just MY kid that doesn't like any dishes made with meat! Your child will LOVE these meals! They are portable too - easy to take on the go and heat up when it's mealtime! So quick, too - just heat them in the microwave and it's time to eat! I also like that there are often coupons for Hormel® Compleats® Kids Microwave Meals in the Sunday paper! Now on to the giveaway!! 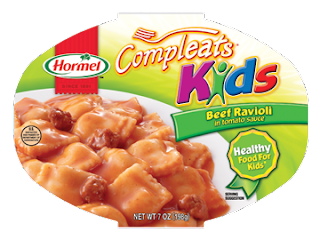 I'm giving one winner two coupons to try Hormel® Compleats® Kids Microwave Meals for FREE, valued at $2.29 each - coupons expire 12/31/11. Follow me on Google Friend Connect - box is in the right sidebar, then leave me a comment with your GFC id & email address. If you already follow me, tell me that & leave your id & email address in a comment. Subscribe to my RSS feed OR Email newsletter & confirm it in your email, leave a comment with your email address. If you already do subscribe, just leave that in a comment with your email! Vote for me on Picket Fence Blogs (click the PFB button near the top of the sidebar! ), then leave a comment saying you did so, with your email address. Can do this once daily til contest ends, just leave a comment daily! Tweet about this giveaway using the button near the top of my blog post ~ then leave a comment, your Twitter id, and your email address. Can do this once daily til contest ends, just leave a comment each day that you do it! Like my Facebook page (click the FB box in sidebar), then leave a comment with your FB id and email address. Follow me on Twitter, leave a comment with your Twitter id & email address! Don't forget - you can leave one comment per entry that you do, and on the daily ones, you can leave an additional comment each day after you do the required entry method! I will verify that entries were completed before winner is notified! Contest is open to US residents, and will run through 11:59 pm EST on Friday, June 10. Winning comment will be drawn & verified that weekend and notified via email by June 13, 2011. Winner will have 48 hours to contact me with their mailing address. If I don't hear from them in that time, a new winner will be drawn, verified & contacted! Coupons will be mailed via USPS by June 20, 2011. Once the winner's prize envelope is dropped off at the US Post Office, I can't be held responsible for lost/undelivered mail. Disclosure: I was not compensated for this review, but we were sent Hormel® Compleats® Kids Microwave Meals to sample, and two free coupons to use. I would rather share the free coupons with one of my blog readers, since D won't eat the meals due to the inclusion of MEAT! lol All opinions about the meals are honest and are completely my own. I passed the additional sample meals on to a friend to use when they camp - I know her son will enjoy them this summer! My 6 year old announced quite loudly that she would love to try the spaghetti and meatballs, lol! "You have just voted for Just Kidding Around Atlanta ! Remember, you can vote every day." I like Just Kidding Around Atlanta on Facebook! Fun & Easy End-of-the-Year Teacher Gifts!!! Mid-week Blog Hop time again!